Patterson Clark recognizes the beauty in weeds. Sort of. I mean, he hates seeing them in Rock Creek Park near the Washington, DC, home he lives in during the week, or in the wilder corners of his homestead near rural St. Michaels, Maryland, and along the roadsides and ditches between the two. But in his disdain for invasive plants that crowd out native vegetation, dilute the local gene pool by hybridizing with native plants, and alter the habitat for local wildlife, Clark has reached a compromise of sorts—he has turned his passion for pulling alien weeds into a driving force behind his art. Shifted relationship. Clark embarked on his current path as a weed warrior and weed artist 15 years ago, after he earned a special permit from the National Park Service, which administers Rock Creek Park in the nation’s capital. He began battling invaders after his busy workdays as a journalist—Clark’s day job is creating informational graphics to report on complex science and policy. Pulling weeds was fine, but Clark began to search for ways to change the dynamic. “I realized that I had built up this antagonistic relationship with the plants, and wanted to shift that relationship to something more positive,” he says. Clark researched the ancient craft of papermaking. He experimented with plant extracts and by-products that could be used as inks and dyes, and learned how to carve intricate printing blocks. Every step of the way, he delved deep into each art and craft, drawing on the focus that allowed him to build a career comprehending complicated subjects and turning them into illustrations that become clear to casual readers in moments. “Eradication” turned to “harvest.” And weeds turned into the raw materials for beautiful artwork that celebrates…the beauty of weeds. Clark’s knowledge of plants is as deep as his passion for detail and his love of art. He describes the subtle differences between English and Irish ivy, the telltale waxy coat on the leaves of white mulberry that differentiate the invasive tree from native red mulberry. Even without leaves, he can spot the stems of Japanese honeysuckle on the roadside and describes how he waxes the cut ends of its wood so it dries slowly, without checking and splitting. It is expertise born of passion, endless curiosity, and growing up accompanying his father, a farmer-turned-botanist, on seed-collecting expeditions. “I did wild harvesting with my dad when he was doing his Ph.D.,” Clark says. He became adept at harvesting the seeds of the catgut plant his father was studying, and tuned into his father’s family history on a farm near Charleston, Illinois. Clark’s finished print of a white mulberry tree was made on mulberry paper with mulberry ink and a mulberry printing block. The Illinois farm left an imprint on Clark, just as the family’s move to Conway, Arkansas, stays with him in a gentle hint of a Southern accent. Ancient crafts. Clark’s weed art starts in a thick roadside stand of white mulberry, a relative of the paper mulberry used in China for paper making since about 100 AD. Clark snips the stems from a dense shrub and brings them home to his kitchen. After the stems steam in a huge soup pot, he peels off the bark and clips the strips onto mulberry boards, then uses a putty knife to separate the bast—the long veins and arteries of the plant—from the bark. That’s the fiber that will make a bright, white paper. The ivory-colored bast strips go back into the pot, boiled in an alkaline solution until their thin fibers can easily be pulled apart between Clark’s fingers. More boiling, rinsing, and seemingly endless stirring begins loosening the fibrous strips. Clark peers through the steam as he stirs, plucking out tiny bits of bark with tweezers. Rinsed and drained, the fibers form a dense ball that looks like dough. Clark places the wad of fiber on a white mulberry chopping block he built, and begins beating it with a pair of homemade white mulberry bats. He rotates the mass, beats it thin, folds it back into itself, rotates, beats, repeats. Periodically, he stops to pick out stray bits of bark that eluded him in the soup pot. Then the pounding resumes. It’s another long process, but vital to separating the mass into individual, hair-thin fibers. 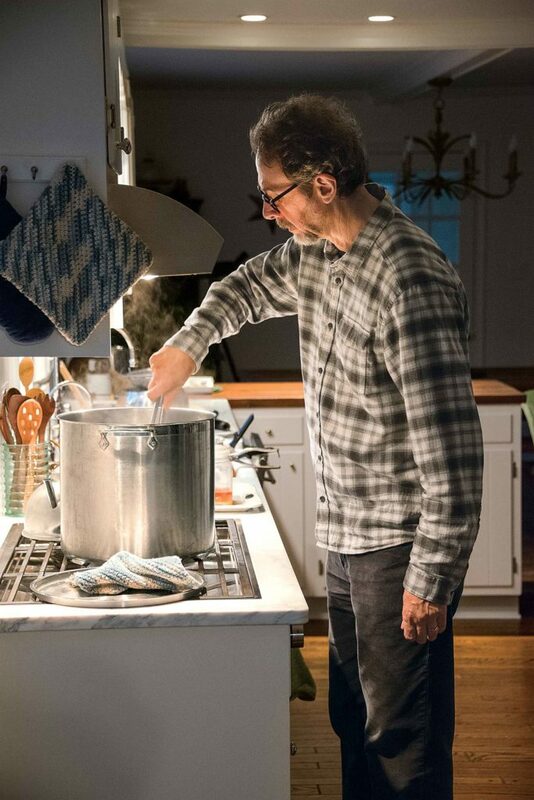 Clark checks his progress by adding a few pinches of fiber to a jar of water. Finally, they form a fine suspension. It’s time to recombine the fibers into paper. Clark swishes the fibers in a large tub, a process called “hogging the vat.” There are a few more pauses to remove a few last bits of bark, then more hogging. Clark picks up a screen on a wooden frame—called a mould—and fits another wooden frame called a deckle on top. With a smooth, arcing sweep, he dips the mould and deckle into the vat, emerging with an even coating of fiber. Any hesitation, any little tip or wiggle, and the paper will end up with thick patches. As water rushes back into the vat and Clark removes the deckle, the transformation is complete—from twigs to a sheet of paper. Inking the block to create the final print. Clark builds a stack, or “post,” of sheets, squeezes it in a 20-ton press, and dries it in a fan-aerated drying press. Then he turns his attention to ink. Alchemy. The shelves of Clark’s studio resemble a medieval druggist’s shop, with stacks of glass jars filled with leaves, sticks, powders, and emulsions. He has spent years discovering the hidden colors of weeds, from the fluorescent yellow he makes from Mahonia to the green of ivy, pink of multiflora rose, or the aqua that appears when bush honeysuckle phloem is steamed in sodium carbonate. Clark’s prints often weave the forms of several weed species in muted arrays that showcase each plant’s dyes and pigments. Today he’s focusing on white mulberry, so he scrapes soot he’s collected by burning mulberry wood chips and uses a glass muller, or pestle, to incorporate the ash into a viscous gum base to form a dark maroon ink. 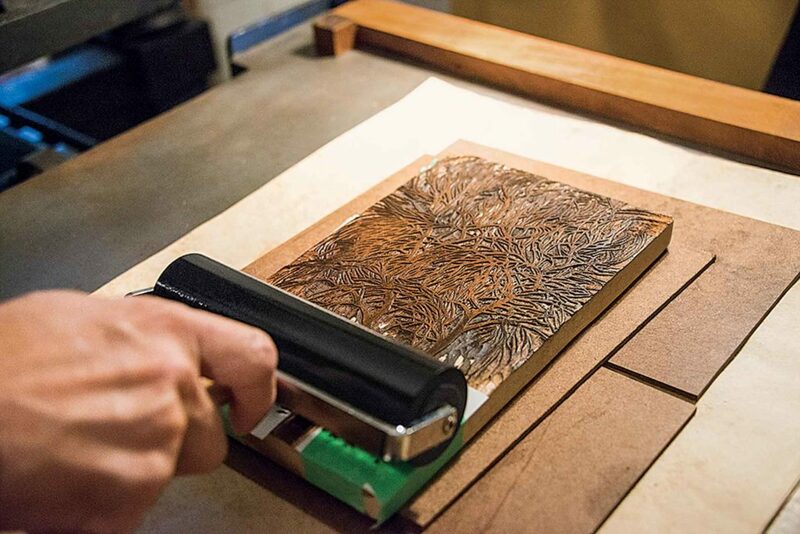 He rolls the ink onto a carved wooden block, carefully places a piece of newly dried white mulberry paper on it, and levers the massive iron arm of a 19th century printing press. A day after cutting the twigs and putting them into his soup pot, the circle is closed and weeds have become art. Clark notes that printmaking is a particularly appropriate way to create art from weeds. 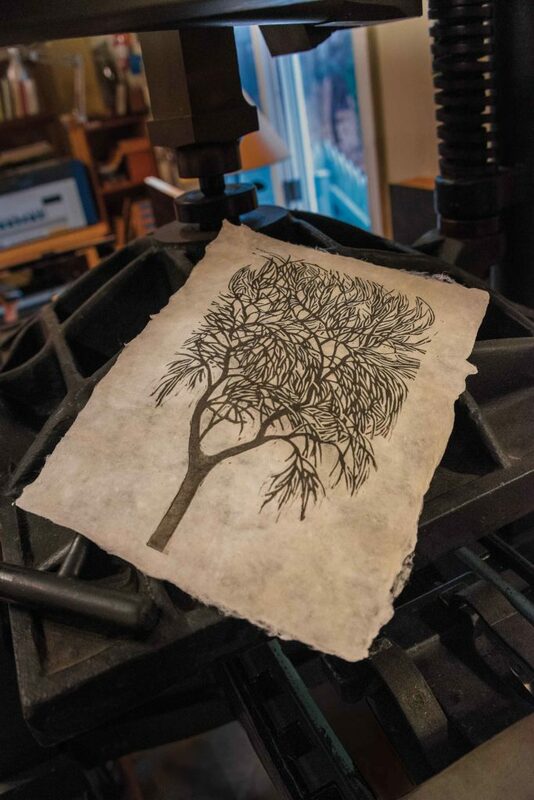 Clark’s prints are taking root in collections around the country, often sought by people who have heard him speak at botany or art lectures or who have encountered his alienweeds.com website. Not surprisingly, his fan base skews heavily toward botanists, weed warriors, and environmentalists who respect his mission as well as his art. Patterson Clark’s imagination is creeping like a vine into new corners of the art world. He’s taken to creating elaborate carvings from the wood of invasive trees, tapping into new colors and textures. He is also working on prints that create moving sequences like flip-book animations, which he plans to photograph so they can be viewed on-screen. In his tradition of creating the blocks, brushes, deckles, and bats for papermaking, he has begun crafting fantastical instruments to use in creating the soundtrack for his animations—a delicate, fine-grained lute-like instrument strung with Asiatic bittersweet that will also provide percussion. Count on Clark to combine alchemy, ancient-sounding instruments, antique presses, and computer-edited animation in his weed control quest.